A moment of solidarity with all of my New England compatriots. Fairway Bowling in Natick Massachusetts will close after 56 years of business. This isn’t just any bowling alley; it’s a candlepin bowling alley. 32 lanes in a 33,000 square foot building. Right on Route 9. One of the major East/West routes in central MA. Now there are only 40 candlepin bowling alleys registered with the state. 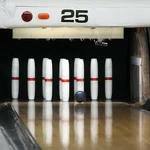 For those tenpin and duckpin-bowling aficionados, candlepins are tall and slender and the bowling ball is small, weighing approximately 2 and half pounds. Candlepin bowling began in Worcester MA in 1880. It was the bowling style of choice for New Englanders. In its heyday, candlepin bowling sported two television shows with cash prizes: Candlepins for Cash hosted by Bob Gamere and Bowling for Dollars hosted by Jim Brit and Don Gillis. If you’ve got a candlepin bowling story, share it here. Fusion Fitness Craze hits SF! The latest fitness craze of Piloxing has hit the Bay Area and described in this week’s SF Chron. But why stop at pairing Pilates with boxing? Here are my ideas about some fusion fitness ideas that I’d like to see. Yo-basket – the pace of yoga practiced on the basketball court. Complete with slow jumps held in mid-air while concentrating on breathing. Bad golf – a combination of badminton and golf where the shuttlecock replaces the dense golf ball or the racket replaces the metal clubs. Spelennis – two people volley and serve tennis balls while descending down into a dark cave on parallel ropes. Jave-luge – the slider lies down on a fiberglass sled without brakes and heads feet first down an icy track while hurling a spear 2.5 meters in length. Bungee-climbing – climbing up a large plastic cord from the ground to the tall structure (building/platform) or movable object (helicopter/hot air balloon) to which it is attached. Let me know what you think will be the next fusion fitness frenzy!